Decoy Over 55s winner Roy Whincup. The last match of the season for those fishing what has been a very successful Whittlesey Winter Series once again produced some good weights from the Beggars Bridge section. Members were fishing for the Fred Wright Memorial Trophy and it was perhaps fitting that match organiser Jeff Tuttlebee took the hounors - a reward for running a very good event. He drew hot peg 11 and made no mistake bagging 23lb 14oz oz of roach on hempseed fishing a short whip line. Runner-up was Richard Linnell, who weighed in 18lb 9oz of roach, followed by Mel Saggers with 12lb 7oz. Six lslands Pool was the venue for the latest Decoy Over 55s match and considering the recent weather it produced some much better sport than expected. It was far from easy though. 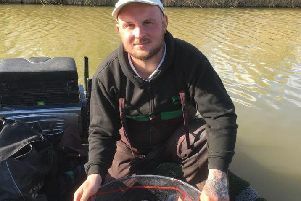 Matchwinner Roy Whincup found four carp early on pole and maggot at seven metres then endured a blank spell before he found the fish again in the margins on peg eight to finish with 41lb 10oz. Chris Saunders fell just short with a level 40lb from peg one followed by Vince Hull with 34lb from peg18. The Consevative Angling Club got their 2018 fixtures off to a good start on the Willow Pool at Decoy Lakes. Mark Parnell on peg three took first place catching in the margins on maggot for 39lb 14oz. Second was Andrew Porter, who put 33lb to the scales, followed by John Parnell with 27lb 8oz. JVAC fished the Oak Pool at Decoy Lakes on Sunday and with the fish still concentrated around the middle pegs a good draw was needed to be in contention. Matchwinner Andy Gausden drew out peg 21, which is just about as good as it gets, and he made no mistake topping the field with 68lb. He caught a few fish in the first half of the match, but had a good run on the long pole and maggot approach later on to see off the chasing pack. Runner-up was Chris Saunders on peg 11, fished the long pole with maggot for 53lb 6oz, then came Nick Carlton with 52lb. The last match of the season on the Old Nene at March is usually a sell-out event but the weather and the fact it has been heavily fished over the past month saw fewer anglers attending. It still fished very well though with James Drakulic taking top spot from peg 14 with a net of skimmers on pinkie over groundbait, weighing in 25lb 10oz. Mark Pollard came second with 23lb 8oz followed by Tony Watling on 19lb 3oz. Yaxley, Farcet, Holme and District AC fished their last match of the season on The Bower, but unfortunately the match weights weren’t as good as recent pleasure fishing weights. Leading the way was Keith Rounding with 4lb 5oz of skimmers and perch, including a fine specimen over a pound. He fished double pinkie on a waggler rig just past the middle. Just behind him was Ivan Marriott with 4lb and Paul Marriott was third with 3lb 11oz. Hotpoint AC got their 2018 series of matches of to a great start on the Six Island Pool at Decoy Lakes. Pete Howson took the honors from peg 22 fishing the pole with maggot over pellet with 70lb 15oz. Float Fish Farm Fishery, Over 50s, Two Islands: 1 David Schwinger (peg 24) 39lb 1oz; 2nd Phil Jones (peg 7) 35lb 3oz. Sections - Vince Hull, Terry Tribe, and Ted Rowe. Float Fish Farm Fishery, Saturday Open, Two Islands: 1 Vince Hull (peg 24) 24lb 15oz; 2 Roy Wells (peg 9) 19l 10oz. Sections - Simon Dow, John Hudson.